Abstract: A few manufacturers have been adding software and hardware features like data encryption, remote applications, and others that operate directly from a USB flash drive. USB drives have completely dominated the removable mass storage market, leaving other standards far behind. For some time now, there have been no real changes to the way manufacturers were presenting their products; everything is USB2.0, everyone offers high capacities, and gimmicky casings for a USB flash drive come and go on a weekly basis... the plastic Sushi shrimp being the most bizarre we've seen. Performance differences between each high speed USB model or another are vague, and given the low cost of USB devices not all that important from a consumer's perspective. A few manufacturers have been adding software and hardware features like data encryption, remote applications, and others that operate directly from a USB flash drive. Here's a question for you though, what do most USB drives on the market have in common? 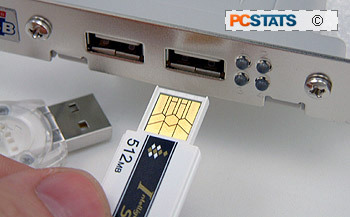 Answer; that ubiquitous four pin USB metal-encapsulated connector, which means the drives must already be a certain size. What PQI has done with its Intelligent Stick Pro 170 is replace the standard metal-wrapped USB connector with a low-profile smart-card-esq connector pad. With a total size of just 43 x 18 x 3 mm, the PQI Intelligent Stick 170 is definitely one of the thinnest USB drives we've ever seen. The PQI Intelligent Stick 170 retails for about $45 CDN ($39 US), and has a speed rating of up to 25MB/s when running through a USB 2.0 connection. The device is compatible with Windows 98SE, ME, 2000, XP, Mac OS 9.x+ and Linux. The pictures do not do the PQI Intelligent Stick Pro 170 justice, it's a really low profile solution. The adaptor basically acts as a docking station for the Intelligent Stick Pro 170, essentially converting the connector into the standard male USB jack we're all familiar with. It's not absolutely necessary to use the adaptor because the low profile connector works just fine with existing female USB jacks on its own. The adapter can be used as a handy storage bay, and keeps the PQI Intelligent Stick Pro 170 safe from physical damage. The PQI USB drive itself is also pretty rigid in spite of its mini-size. The identifying marks on the PQI Intelligent Stick Pro 170 are pretty normal, it states the size of the drive (in this case 512MB) and on the back users will find the unit serial number. On the accompanying CD users will find a PDF copy of the user's manual, Windows 98 drivers and a format utility. During data transfer activities, the PQI Intelligent Stick Pro 170 has a little orange LED that blinks. When the device is idle, no LED is illuminated. 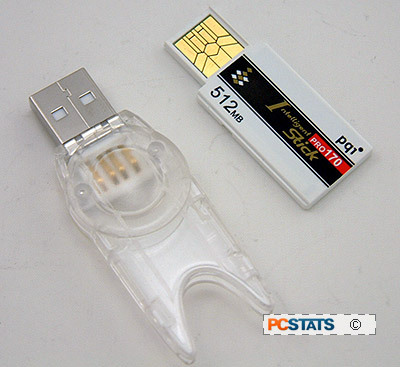 The PQI Intelligent Stick Pro 170 has a speed rating of 25MB read (170x speeds hence the name) and 17MB/s write. 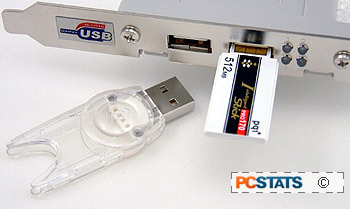 Compared to other USB drives on the market, the PQI Intelligent Stick Pro 170 is definitely one of the speedier models. The drive without the USB adapter has a total weight of 2.8 g and can operate in temperatures between 0-65 Celsius. The PQI Intelligent Stick Pro 170 is compatible with both 3.3V and 5V USB standards. 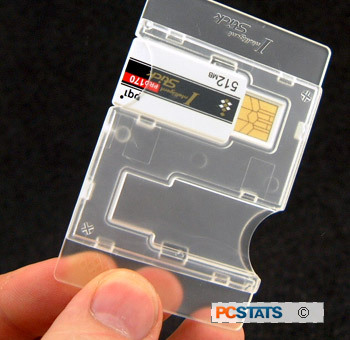 The 80 x 53 x 5 mm clear plastic credit card sized carrier that comes with the PQI Intelligent Stick Pro 170 makes storing the small device less prone to result a... now where did I put that thing... situation.